The global phosphorus trichloride market has been exhibiting a substantial rise over the last few years. The phenomenal progress in the chemical industry and the escalating global population, leading to an expanding need for food, have emerged as the main factors behind the significant growth of this market. With the increasing demand for food across the world, the usage of pesticides, insecticides, and herbicides in the agriculture industry is on a surge, specifically in emerging economies, which is likely to boost this market further in the years to come. The opportunity in the global phosphorus trichloride market is anticipated to rise at a CAGR of 5.20% between 2016 and 2024, rising from US$1.23 bn in 2015 to US$1.92 bn by the end of 2024. Although the future of this market looks thriving, the upswing in the processing cost on the production of phosphorus trichloride, affecting its final cost, may hamper the market’s growth to some extent over the next few years. There are two grades of phosphorus trichloride available in the global market: Pure grade and analytical reagent. With a share of nearly 94%, the pure grade phosphorus segment led the global phosphorus trichloride market in 2015. Analysts predict the scenario to remain same over the next few years, owing to the widespread usage of pure grade phosphorus in the production of agrochemicals, phosphorus oxychloride, and plasticizers. The demand for analytical reagent, however, is expected to rise at a faster pace than pure grade phosphorus in the near future. Phosphorus oxychloride, chemical intermediates, agrochemicals, plasticizers, pharmaceuticals, oil additives, and surfactants are the key application areas of phosphorus trichloride. Among these, agrochemicals segment has been registering a higher demand for phosphorus trichloride. With it being an important component in the production of pesticides, herbicides, and insecticides, the trend is likely to remain so in the years to come. Apart from agrochemicals, the demand for phosphorus trichloride is anticipated to witness a substantial rise in the pharmaceuticals segment over the next few years. The global phosphorus trichloride market reports its presence across North America, Europe, Asia Pacific, the Middle East and Africa, and Latin America. Asia Pacific dominated this market in 2015 with a share of more than 44% and is expected to maintain its dominance over the forthcoming years, thanks to the significant expansion in the key end-use industries, such as the agrochemicals and the pharmaceuticals sectors. The rising consumption of phosphorus trichloride in China is also projected to support the Asia Pacific market in the near future. North America, which stood second in the global market for phosphorus trichloride in 2015, is predicted to retain its position in the years to come. The U.S. and Canada are likely to surface as the key contributors to this regional market over the next few years. 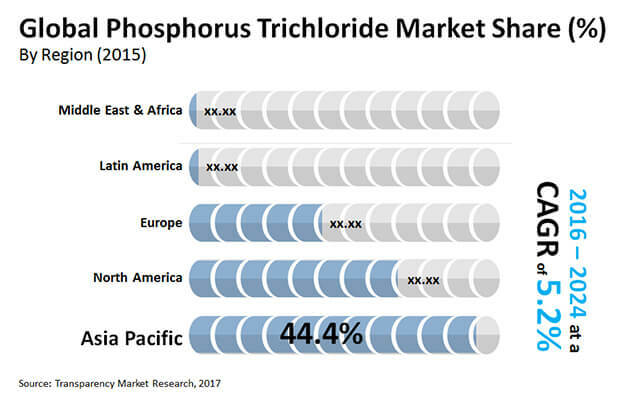 Amongst others, Germany and France is projected to drive the Europe market for phosphorus trichloride and the Latin American market is anticipated to be led by Brazil. Monsanto Co., Rhodia, Charleston, S.C., Syngenta, The Mosaic Co., Solvay S.A., Excel Industries Ltd., Shanghai Fopol Chem-Tech Industry Co. Ltd., PotashCorp, Guangzhou Zoron Chemical Technology Co. Ltd., Lanxess, LianYunGang Dongjin Chemical Co. Ltd., Binhai Wuzhou Chemical Co. Ltd., Yixing Dongchang Chemical Co. Ltd., Punjab Chemicals and Crop Protection Ltd., Sandhya Group, Duc Giang Chemicals and Detergent Powder, Xuzhou JianPing Chemical Co. Ltd., and United Phosphorus Ltd. are the main vendors of phosphorus trichloride across the world. Phosphorus trichloride, a colorless or slightly yellow fuming liquid, retains a pungent odor reminiscent to that of hydrochloric acid. It is generally used as a chemical intermediate in the manufacturing of agrochemicals and flame retardants. It is commercially available as pure grade and analytical reagent grade. In terms of application, agrochemicals/pesticides and phosphorus oxychloride held majority share in the global phosphorus trichloride market in 2015. Rising demand from these end user industries is expected to boost phosphorus trichloride market during the forecast period. This study analyzes, estimates, and forecasts the global phosphorus trichloride market in terms of volume (tons) and revenue (US$ Mn) from 2015 to 2024. The report also analyzes several driving and restraining factors and their impact on the market during the forecast period. The report provides a detailed view of the phosphorus trichloride market based on applications. Key applications included in the report are phosphorus oxychloride, chemical intermediates, agrochemicals/pesticides, plasticizers, pharmaceuticals and others (comprising oil additives, surfactants, etc.). In terms of grades, the market is segmented into: pure grade and analytical reagent grade. Furthermore, the report segments the market based on key geographies such as North America, Europe, Asia Pacific, Latin America, and Middle East and Africa. It also provides market volume and revenue for each application and grade under every regional segment. The phosphorus trichloride market is further analyzed into major countries of each region. Based on applications, grades and countries, the report analyzes the attractiveness of each segment with the help of an attractiveness tool. The study includes value chain analysis, which provides a better understanding of key players in the supply chain (from raw material manufacturers to end-users). Additionally, the study analyzes market competition and industry players using Porter’s five forces analysis. Secondary research sources that are typically referred to include company websites, annual reports, financial reports, broker reports, investor presentations, and SEC filings, internal and external proprietary databases, and relevant patent and regulatory databases. Other sources include national government documents, statistical databases, and market reports, news articles, and press releases and webcasts specific to the companies operating in the market. Secondary sources referred for the study of the phosphorus trichloride market include InfoMine, U.S. Geological Survey, Internet Archive Educational Portal, and company presentations. The report includes an overview of the market share of key companies in the global phosphorus trichloride market. Key players profiled in the phosphorus trichloride study include Monsanto Company, Rhodia, Charleston, S.C., Syngenta, Mosaic Company, Solvay Chemicals, Akzo Nobel N.V, Shanghai Fopol Chem-Tech Industry Co., ltd., Potash Corporation of Saskatchewan, Guangzhou Zoron Chemical Technology Co., ltd., Lanxess AG, Lian YunGang Dongjin Chemical Co., ltd., Binhai Wuzhou Chemical Co., ltd., Yixing Dongchang Chemical Co., ltd., Punjab Chemicals and Crop Protection Limited, Excel Industries Limited, Sandhya Group, Duc Giang Chemicals and Detergent Powder, Xuzhou JianPing Chemical Co., Ltd. and United Phosphorus Limited.